Any quantity only $28.99 per oz over spot! The Royal Canadian Mint is one of the most highly respected mints in all of the world. The mint produces various coins, bars and rounds and is responsible for producing Canadian coinage. The RCM name carries a solid reputation for quality, ingenuity and creativity. The 1 ounce gold bar with assay is simply another example of RCM quality and beauty. As far as gold bars go, you will have a hard time finding anything superior in terms of quality and visual appeal. Produced by the world-renowned Royal Canadian Mint. 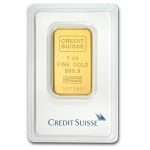 If you are looking for a visually appealing gold bar, the one ounce RCM Gold Bar with assay may be an excellent choice. 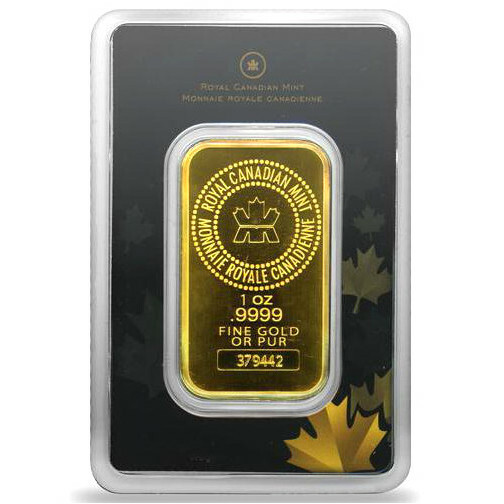 These stunning gold bars feature a design that is highly symbolic of Canada-the maple leaf. The front of this solid gold bar features an iconic maple leaf design with the Royal Canadian Mint name encircling it in both English and French. The bar’s obverse also features inscriptions of the bar’s weight, purity and unique serial number. The assay card also features maple leafs on its face as well as the mint’s name in both English and French. With a relatively simple yet elegant design, this .9999 pure gold bar makes an excellent addition to a any precious metals portfolio. 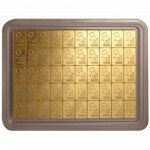 You can buy these RCM Gold Bars with confidence. The assay card is a testament to the bar’s ingredients and purity. Combined with the RCM quality standards, you will not see a finer gold bar. If you have any questions about these RCM Gold Bars, our representatives are here to help and can be reached toll-free at 1-888-989-7223. You can also conveniently use our live chat feature during regular business hours for live support.